Junior Jessica Brown played a pivotal role in Cal State San Bernardino taking three of four games from No. 16 UC San Diego last weekend. So it was only fitting she has been honored as this week’s CCAA Player of the Week. Brown, a graduate of Alta Loma High School and Citrus College, hit a towering three-run, walk-off home run in the Coyotes’ 4-1 win over the Tritons in the second game of Friday’s doubleheader. In the opener, she had a solo home run. On the weekend, she went 7-for-14 at the plate against UCSD, with two doubles along with her homers. She was intentionally walked twice in the fourth and final game of the series, eventually won by the Coyotes 4-3 in nine innings. CSUSB (9-5 overall and 4-2 in the CCAA) play host to Cal State Monterey Bay this weekend in another key CCAA four-game series. 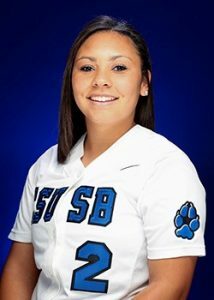 This entry was posted in Cal State San Bernardino softball, Jessica Brown by Michelle Gardner. Bookmark the permalink.